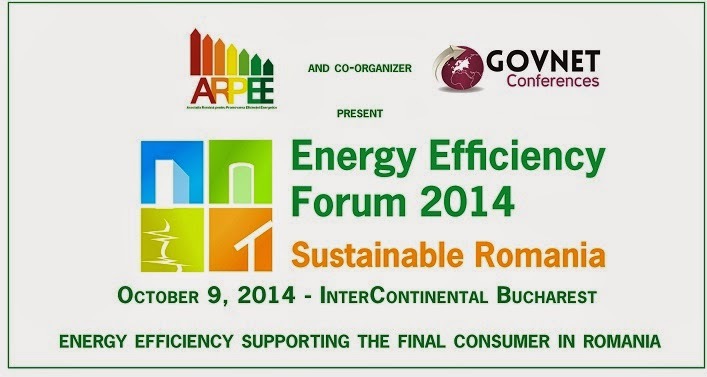 The oportunities and challenges of implementing energy efficiency programs as the next step in Romania’s energy strategy will be debated in the largest conference dedicated to this sector in Romania, the Energy Efficiency Forum 2014, organised by the Romanian Association for Promoting Energy Efficiency ARPEE and GOVNET Conferences. This national conference comes at a crucial moment as the implementation of the 2012/27/EU Directive to Energy Efficiency will come into force. The Summit speakers will provide the latest information to help your company adapt and comply to the Directive requirements - it will also involve you in the debate that shapes the future directions of Romania's energy markets and energy services development. The event is created to generate business ventures and present the investment opportunities in Romania's energy efficiency programs as well as to connect government representatives and regulatory authorities with private companies. Target group: Local and International experts from the energy industry and Romanian authorities supervising and regulating the field. Gheorghe Tucu, General Director Valeg - Increasing energy efficiency in industrial processes. Is Romania ready? The Romanian Energy Efficiency Forum 2014 is a perfect networking platform that will create new ventures and investment opportunities in the area of sustainable and energy efficient program development.